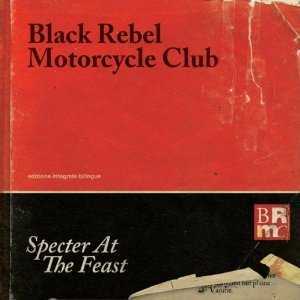 There’s something about Black Rebel Motorcycle Club, you know. They shouldn’t be this cool. Sometimes they play like angry, dirty punks; sometimes they play like they’re in a psychedelic space trance. They sing about the ugliness of war and the sweet release of death, like a trio of ghosts who happened upon Black Sabbath and close harmonies in the same afternoon. By all the ordinary rules of the music world, they ought to be a heavy metal band with pretensions up to their eyeballs. But they aren’t. They defy convention. They defy genres. It’s hard to fathom them. It was hard to fathom that first record of theirs some 12 years ago, and ‘Specter at the Feast’ isn’t going to be fathomable either. Another 12 years from now you’ll still be playing it, wondering how music like this actually, physically came to be. Alright, enough teasing. Let’s get stuck into details, because that is what BRMC rejoice and delight in. Prayer bell chimes open ‘Fire Walker’, a growling, mysterious number that moves with dark purpose, immediately living up to that gloriously macabre album title. Hayes, Been and Shapiro are taunting us, tricking us into stepping into their musical netherworld, where spectres prowl, voices chant, and whispers of doom flicker and distort in the electric mist. This powerful, moody piece has barely given us a glimpse of this eerie soundscape before ‘Let The Day Begin’ creeps up and pulls us by the scruff of the neck all the way in. It’s one hell of a Valhallan feast of a song, written in 1989 for The Call by Michael Been, father of BRMC’s master songwriter/bassist Robert Levon Been. And so it is to honour the spirit of his father that he adopts this devilishly hook-some, snarling sort of riff to toast those present, and those not quite present. This is a song of celebration; for the dreamers, for the downtrodden, for the countless dispossessed. Imagine Dylan’s ‘Chimes of Freedom’ sped up to a gallop, running for you with fangs and claws. In fact, don’t imagine, the whole EP (along with the roaming, elegaic ‘Returning’) was released for free on their website last month. ‘Lullaby’ retreats the volume to acoustic guitars for a soothing summer strummer. The grieving voice isn’t angry now, just helpless and restless. “You are the quiet in my soul,” he realises. You want to linger here, but you’re not allowed to. Not yet. The brash, punkish attitude that marked BRMC’s first impact with ‘Whatever Happened To My Rock ‘n’ Roll?’ is alive and well in the middle of the record, as ‘Hate The Taste’, ‘Rival’ and ‘Teenage Disease’ succeed each other in a series of punchy, frantic-paced rockers. It’s good old-fashioned foot-tapping stuff, but you hardly know what to make of these songs alongside the bolder, more atmospheric material on ‘Specter…’. Speaking of which – the second half is where things get wyrd with a ‘y’. You have blues spiritual vibes echoing in ‘Some Kind of Ghost’. Eerie a cappella harmonies close in on you in ‘Sometimes The Light’. ‘Sell It’ opens with all the squawks and croaks and crawling mist you could expect of a blasted heath populated by vile witch prophets. These are the songs that creep up on you in the night; the songs that won’t let you alone in your own head, their haunting melodies hovering through the fog and filthy air. At times, this record runs on parallel lines with the surreality of Beach House’s album ‘Myth’, only BRMC are skewing darker, delving deeper and coming out the other side with scars. ‘Lose Yourself’ is a prime example, so nakedly cathartic and spellbinding, almost a direct counterpart to Beach House’s own void-gazing album closer ‘Irene’. We’re brought full circle as those chimes toll their last, and ‘Specter at the Feast’ pretends that it is done with you. Don’t you believe it. Don’t you dare believe it. This is an album that won’t let go of you, full of catchy, offbeat gems and dream state soundtracks. There’s just no question: this is easily the best and most distinctive album BRMC have made since their 2005 Americana experiment ‘Howl’. You’ll catch yourself pinging those chokes and stutters and squeals around your head for a long time to come, wondering how the hell Peter Hayes and Robert Levon Been ever coaxed those sounds out of their instruments. They’ve always been a band with a subtle taste for the macabre, indulging their darker side without making a pantomime of it. This is their Macbeth; an exploration and a celebration of life and death, brimming with phantoms and pathos, held together with a sound so easy to fear and to revere in equal measure. This is indeed a classic you see before you.